ERC Hosting Review 2019: Is ERC Hosting a Good Hosting? ERC Hosting specializes mainly in standard web hosting and WordPress hosting. Its range of products is rather limited compared to other vendors, but the ERC Hosting team is highly experienced and their expertise is clearly reflected in the hosting products. ERC Hosting is a Netherlands-based hosting company that has been in operation for over 20 years. It specializes in standard web hosting, WordPress hosting, and web design services. It also offers additional services such as cloud backups, WordPress maintenance, Office 365, and VoIP. Its website is slightly confusing to navigate, but quite informative. Services and support are primarily available in Dutch. All packages come with Installatron, which allows you to easily install apps without having to pick up any programming or web design knowledge. 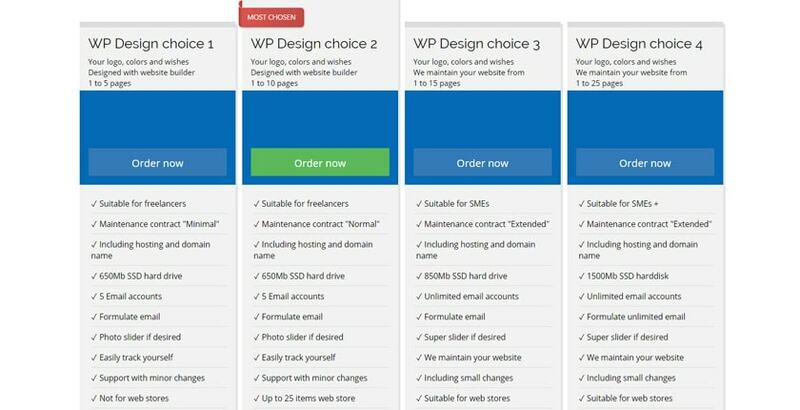 At first glance, it seems that ERC Hosting tends to cater to beginners, since you’ll be able to take advantage of services such as having WordPress or OpenCart pre-installed for you during checkout. However, the checkout flow is also rather confusing if you’re new to hosting, as you’ll have to specify just about every aspect of your hosting package yourself. For instance, you must list how much disk space and bandwidth you’ll need up front — which would be difficult to gauge right from the start. Other than that, you’ll have the DirectAdmin control panel available with all packages. Similar to cPanel and just as intuitive, this allows you to easily manage your website. It comes with a comprehensive toolset to adjust your hosting, emails, backups, FTP accounts, and more. It’s also worth mentioning that ERC Hosting’s uptime history is quite impressive. The company has maintained an overall 100% network uptime over the past few months. However, there’s no apparent uptime guarantee with this provider. ERC Hosting offers four standard shared hosting packages: Bronze, Silver, Gold, and Diamond. All four plans include free SSL certificates, but they vary in other features including the number of databases and email accounts. On the downside, the company doesn’t provide a free trial or any money-back guarantee, so you’ll be using ERC Hosting’s services at your own risk and expenses. Domain registrations are also an extra charge with ERC Hosting. If you want to sign up for a subscription, ERC Hosting accepts PayPal, iDEAL, direct debit, and bank transfer. 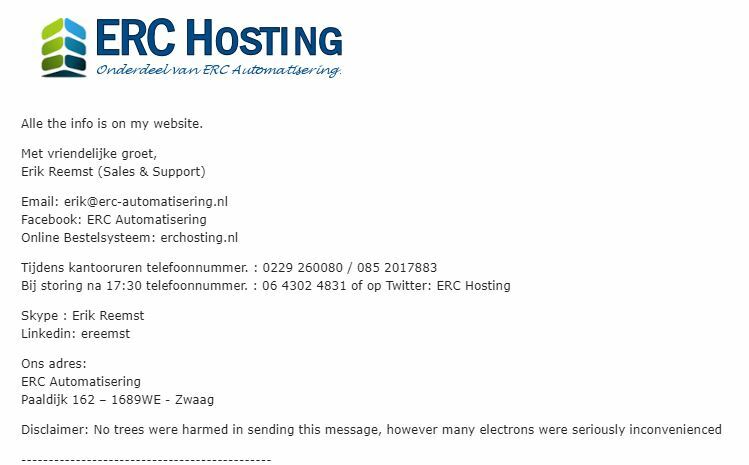 I must admit that I wasn’t at all happy with ERC Hosting’s customer support. I opened a support ticket with several questions about features not mentioned anywhere on the website — and then received a pointless response a week later referring me back to their website. Even the knowledge base and FAQ section are very limited. On a brighter note, there are a few useful tutorials on the website, which may come in handy while you’re waiting for the rather lackluster support team to get back to you. Otherwise, you can save yourself the trouble and give them a call on their support line to get all the help you need. In spite of its years of experience, ERC Hosting is quite limited in many ways if you compare it to other web hosting providers. It does offer perks such as SSD storage, free domains, and an uptime SLA, but it still falls short on customer support, its refund policy, and range of web hosting solutions. Get standard web hosting, WordPress hosting, and web design services at ERC Hosting. Wondering how ERC Hosting stacks up against other Web Hosting companies? Enter any other Web Hosting company and we will give you a side-by-side comparison.